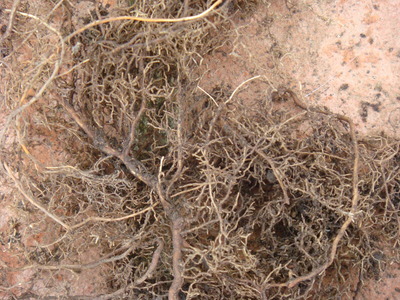 This forms a capillary like carpet around plants in a large area of my garden, it lurks about six inches below the surface and affects non woody plants; they thrive for about a year and are then choked by this matting. It is reddy brown in colour and white when scraped. I am at my wits end and can't find a reference to it anywhere. It looks like roots. Have you got some trees or large shrubs around? You can cut them off without killing the tree/shrub they are coming from. Then, although it's hard work, you could dig and add lots of compost to enable you to plant the area up. I have done this in 'rooty' areas in my garden. Every time you hit more, use your secateurs and chop. I know it's a daunting task, but do it in small setions and you will win in the end!